It seems to me that nothing is more important in a marriage than harmony. Without harmony, life becomes a struggle where each person is tugging, even though subtly, to have things their way. 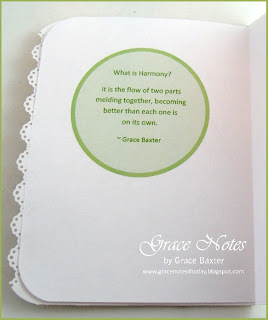 Before creating this card, I went on a search for definitions of "harmony". Other than the musical reference, I could not find ANY! This was a surprise to me. So I came up with my own definition. This anniversary card is for a couple celebrating 35 years of marriage. I love the imagery of the two birds and their little home in the trees. It suits the wife who loves birds and gardening, and it ties in with her interest in music. The verse inside is a special poem I composed just for them. The card size is larger than normal. Background is embossed and inked in light green. The right edge is punched with the MS lace punch, then inked with Tea stain ink. The birds and "Harmony" title are from a sticker set. 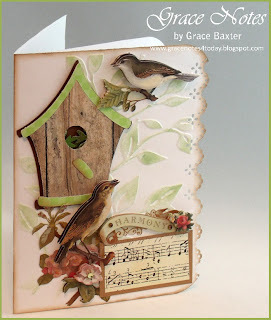 The small piece of music is printed paper mounted on bronze cardstock. The birdhouse is cut from Stretch Your Imagination and the green layers are softly sponge-inked with Tea ink. This is beautiful!! What a wonderful sentiment you wrote for them!! 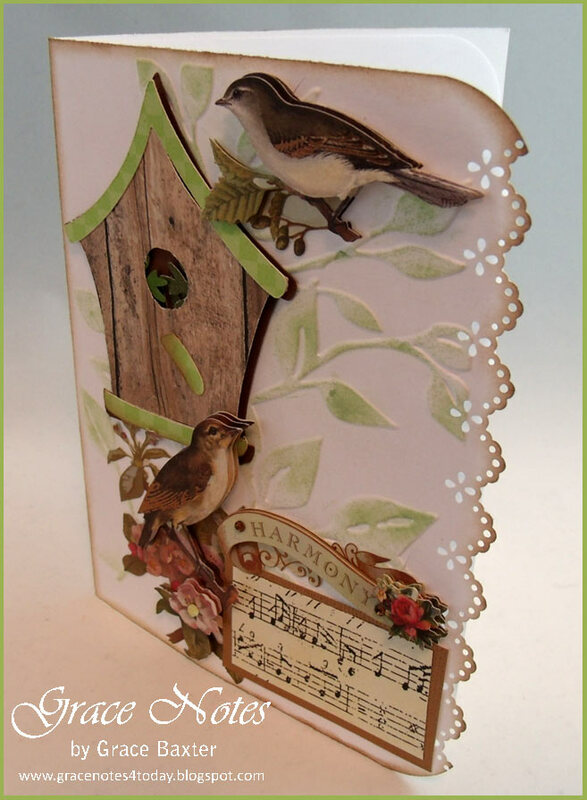 I love the embossed background! GORGEOUS card!!! Love the details and the embossing looks awesome!! thanks for stopping by my blog-appreciate the sweet comment. My shoes have a 4 inch heal...eeek!